The Milwaukee Bucks are a professional basketball team based in Milwaukee, Wisconsin. Bucks were formed in January 1968 when the NBA awarded a franchise to Milwaukee Professional Sports and Services, Inc. (Milwaukee Pro), a group headed by Wesley Pavalon and Marvin Fishman, The Milwaukee. They play in the National Basketball Association (NBA). The current franchise owner is U.S. Senator Herb Kohl. In October, the Bucks played their first NBA regular season game against the Chicago Bulls before a Milwaukee Arena crowd of 8,467. Their first victory came in their 6th game as the Bucks beat the Detroit Pistons 134-118; they would win only 26 more games in their first year. The following season, the Bucks added the final piece to their championship puzzle by adding Oscar Robertson, known as "the Big O," to the team. Subsequently, in only their third season the Bucks won 66 games and went on to win the NBA Championship on April 30, 1971, by sweeping the Baltimore Bullets in Milwaukee, 118-106, in Game 4 of the finals. By winning the title in only their third season, the Bucks became the fastest expansion team in any of the four major American sports leagues (NFL, MLB, NBA, and NHL) to win a world championship. In 1972, the Bucks snapped the Los Angeles Lakers record 33-game winning streak during a nationally televised game; in 1973 the Bucks recorded their third consecutive 60-win season, the first NBA team to do so. Again the Bucks were back in the 1974 NBA Finals against the Boston Celtics. In Game 6 of the series, Jabbar made a patented "sky hook" shot to end a classic double-overtime victory for the Bucks. The Bucks lost Game 7 and the series to the Celtics. After the 1974-75 NBA season, the Bucks pulled a mega-trade by sending Jabbar to the Lakers for Elmore Smith, Junior Bridgeman, Brian Winters and David Meyers. In 1985, Milwaukee businessman (and now U.S. Senator) Herb Kohl bought the Bucks after fears that out-of-town investors could buy the team and move it out of Milwaukee. The Bucks had two high lottery picks in a row in the early 1990s that allowed them to get two high-caliber offensive players. In the 1993 NBA Draft, Milwaukee selected power forward Vin Baker with the eighth overall pick. To honor their 25th Anniversary in 1993, the Bucks changed their uniforms, replacing the cartoonish deer in favor of a more regal one. Also, red was replaced by purple.From the 1994-95 season to the 1996-97 season, the Bucks were led by the strong offensive play of both Robinson and Baker. Following the 1996-97 season, Baker was traded to the Seattle Sonics in a three-team deal that brought Terrell Brandon and Tyrone Hill to Milwaukee. On June 28, 2006, the Bucks revealed a new color scheme as well as an updated logo. The new colors revealed were dark red and forest green, returning the team to its original color scheme, although they retained silver from the previous color scheme. Its new uniform identity was also revealed on the last week of September 2006. The beginning of the 2006-07 season gave Bucks' fans high hopes. The Bucks had a fantastic December going 11-6, but soon after, starters Michael Redd, Charlie Villanueva, and Moe Williams suffered key injuries. For much of January, this left Andrew Bogut as the only remaining starting player from the anticipated lineup. In February the Bucks lost a crucial game to the Boston Celtics who were riding a franchise long 18-game losing streak. On June 28 2007, the Bucks drafted Yi Jianlian from China with the No. 6 pick. Yi is widely regarded to be the best Chinese prospect to come out of China since Yao Ming. Although Yi is considered by many to be a strong offensive player, his selection by the Bucks brought many concerns, leading some commentators to consider Yi to be a high risk choice. After being drafted by the Bucks, Yi refused to visit Milwaukee and his agent has openly tried to convince the Bucks to trade Yi to another team by threatening that Yi would return to China rather than play for the BucksYi Jianlian recently signed a deal with the Milwaukee Bucks on August 29, 2007 in Hong Kong. The Milwaukee Bucks are currently 3-2 in the preseason following their 106-97 win over the Minnesota Timberwolves. The Milwaukee Bucks are a remarkable pro American basketball team that has been entertaining Americans all over the US and even over in Canada with their mind blowing, breathtaking basketball antics the likes of which few teams are equal to. This sensational team is part of the Central Division within the NBA's Eastern Conference. The Milwaukee Bucks were founded in 1968 and have been playing ball since then under the same name. This fabulous basketball team is located at the Bradley Center, its home arena, in the city of Milwaukee within the superb state of Wisconsin. This is a team that has totally redefined what basketball means to many people all over the US. The official Milwaukee Bucks colors are white, natural red, hunter green and silver. The Milwaukee Bucks are coached by the accomplished Scott Skiles and have as an affiliate, the Fort Wayne Mad Ants. To date, the Milwaukee Bucks have won numerous championships and bagged a lot of titles. Foremost amongst all of these come the NBA Championship, a championship the Milwaukee Bucks won after hardly three years passed from their founding. Aside from that, this pro basketball franchise has also won two different Conference titles and thirteen different Division titles. Seven of this team's numbers have been retired with the team itself owned by Herb Kohl. This pro basketball outfit has had a rich history since draft their first player, Charlie Paulk from the Northeastern University, in 1968. The first match was won the same year when the Milwaukee Bucks defeated the Detroit Pistons within the same month of their founding. In 1971, this team made NBA history by becoming the fastest and quickest expansion team in all off pro sports to win a Championship. Thus, this is definitely a team to be watched live through Milwaukee Bucks Tickets. The average Milwaukee Bucks tickets price will cost you between $115 and $224, if you are looking for the cheapest seats then catch the event being held at the Little Caesars Arena, Detroit on 20/04/2019. The average ticket will cost you the highest on 24/04/2019 at the Fiserv Forum, Milwaukee. Minimum get in price is for Milwaukee Bucks tickets is $19 for the event being held at the Little Caesars Arena, Detroit on 20/04/2019 , there are some venues that have a much higher get in price, for instance the cheapest seats at the Fiserv Forum, Milwaukee on 24/04/2019 will set you back $59. Do you guys also sell bulls vs bucks tickets? We have an entire inventory set up for Chicago Bulls Vs Milwaukee Bucks Tickets, please visit it and book your passes today. I want milwaukee bucks tickets for cheap! Please help me find them online! Ticket Luck has the best tickets to offer you for the happening events! Quickly grab your Milwaukee Bucks Tickets from our website and avail our special discount! 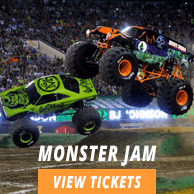 Do you sell bucks tickets cheap priced here on your website? Yes, we do sell Milwaukee Bucks Tickets at cheap prices here on our website. Look through our page for details and order your tickets right away! Pls somebody look out for cheap milwaukee buck tickets, i am in a dire need of these tickets! Our Livehelp Reresentative should be able to look out for cheap Milwaukee Bucks tickets. Please contact our CSR and get timely help. Where can i get bestvalueticketsmilwaukeebucks? Milwaukee Bucks Tickets can now be purchased at Ticket Luck at the best possible rates. Please make the best of this opportunity. Are there any hot deals on bucks tickets? You can have a look at our exciting Milwaukee Bucks tickets avaialble at competitive prices or use our live help service. I cant make it to the event. Can i return lucky bucks tickets february 13th? No, as per the company policy, you cannot return Milwaukee Bucks Tickets. Sales once made are considered to be final. While searching for cheap milwaukee bucks tickets, i was referred to your site. Where those tickets are available? Kindly click Buy Milwaukee Bucks Tickets to navigate to our inventory which is constantly updated with cheap tickets. I want milwaukee bucks group tickets at cheap prices? Sure. Please go through the list of the tickets available at Milwaukee-Bucks page and choose the best for you. Where to get cheap milwaulkee bucks tickets from? Our web site is a good source to get some Milwaukee Bucks Tickets for low rates. I was wonder that when would i receive my bucks tickets? Dont worry. You will get your Milwaukee Bucks tickets within few working day. I want cheap tickets to milwuakee bucks. Help me find them? Milwaukee Bucks Tickets are available with us at great prices so go for it. Can I collect my discount milwaukee bucks tickets through the will call window? Milwaukee Bucks Tickets can be collected through the will call window. Are bucks cheap tickets open for advance bookings? Milwaukee Bucks Tickets with us are not available at any such deal. Do you have a buy one get one free deal at cheap tickets for the bucks? Milwaukee Bucks Tickets with us are not offered at any such deals. Will seats be mentioned on cheap bucks tickets? Milwaukee Bucks tickets do not have seat numbers written on them. Do you have milwaukee bucks low ticket prices? Yes we sure do have tickets you are looking for.